Also, recall that we have already proven that neither the electric nor magnetic field have any components in the direction of wave propagation (z-direction in this case). Therefore, there is no z-component for magnetic field. 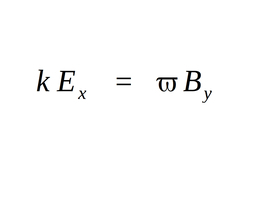 However, there potentially exists (as of the moment) a component of B in the direction of E (the x-direction). We aim to prove that such an occurrence is not possible. 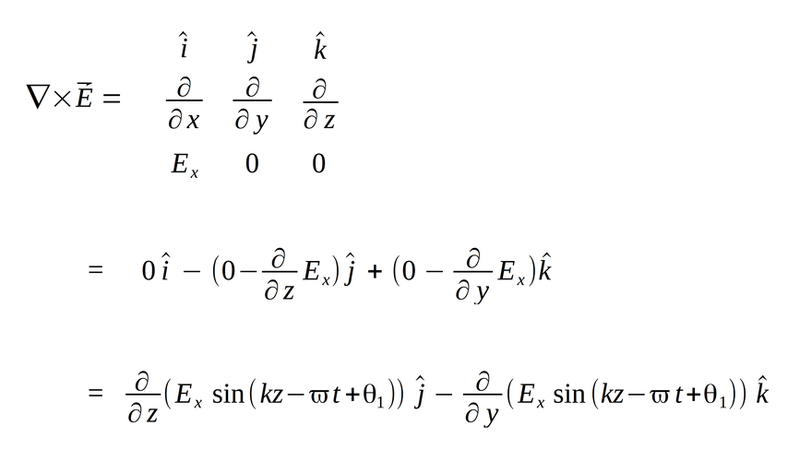 We now recognize that for the above statement to be true, the i component on the right hand side of the equation must be zero for all values of z and t. The only way for this to be possible is if the magnetic field (B) has no component in the direction of the x-axis (B sub x = 0). Therefore, the magnetic field (B) can have no component in the direction of the electric field (E) and hence E and B are mutually orthogonal. This tells us that both the electric and magnetic fields have the same phase constants and therefore they are oscillating in phase. 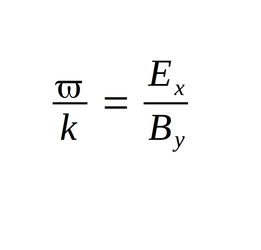 The terms on the left and right side of the equation (kE and omega B) are effectively the amplitudes of the electric and magnetic fields respectively. Being that they are equal we realize that the amplitudes of the electric and magnetic fields are also equal for an electromagnetic wave. 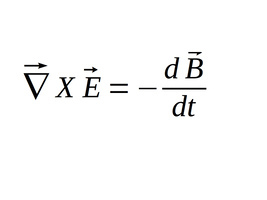 Thus we come to the additional conclusion that the magnitude of E (electric field) divided by the magnitude of B (magnetic field) is equal to the speed of light.